Chambord Chateau was born in the 16th century in the imagination of one of the most flamboyant French kings, François 1st. With the help of Leonardo da Vinci he not only built the largest and most original castle of the Loire Valley, but also filled it with enigmas and mysterious symbols that have not yet revealed all their secrets. In Chambord, figures defy the imagination. The estate is as vast as inner Paris and is entirely surrounded with a 32 km long wall where wild game abounds. 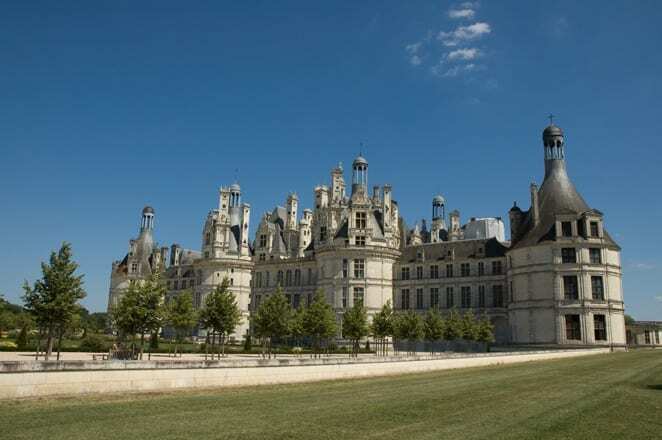 It took 220,000 tones of rock collected in a quarry 50 miles away from Chambord to achieve this fairy-tale castle. It has no less than 426 rooms, 282 fireplaces, 77 staircases and 800 carved capitals! 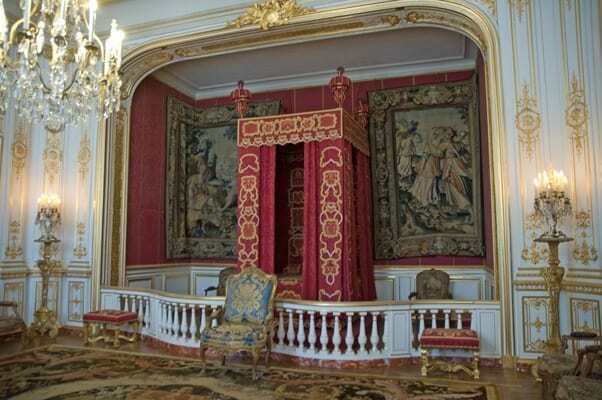 Unlike many other royal castles Chambord was never furnished. When the king and his court went hunting there, a multitude of servants brought all the furniture, tapestries to cover the walls, dishes and pans for the meals, and get the castle ready for at least 2,000 people. 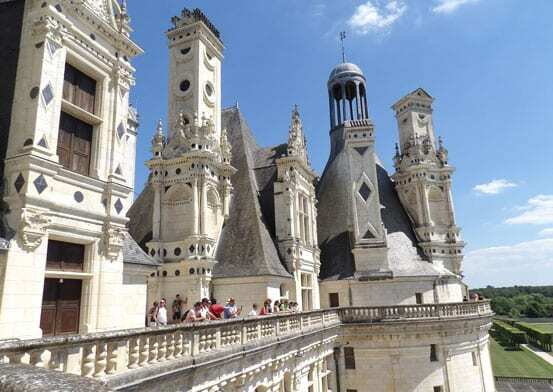 When you will visit Chambord you will go from one empty room to the other except for the apartments of the first floor where 17th and 18th centuries’ decors have been installed. François and Leonardo well achieved their goal to fill Chambord Chateau’s visitors with wonder. Whether kings, princesses or mere mortals, anyone approaching it, falls under the spell of this imposing yet incredibly attractive castle topped with countless chimneys, turrets and carved capitals. An unforgettable silhouette not to be compared with any other castle in Europe, that anyone can recognize at first glance. 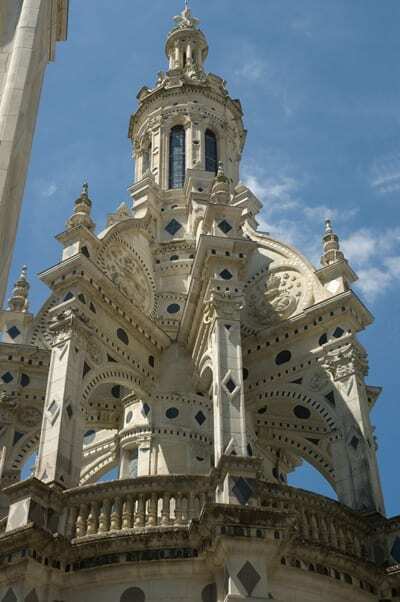 Chambord is to architecture what the Mona Lisa is to painting and belongs to the heritage of mankind. 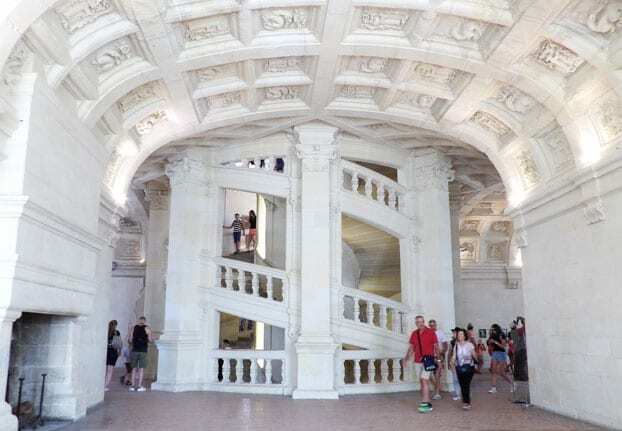 Once inside you will be irresistibly drawn to the double-helix staircase, one of Leonardo’s masterpieces. Two separate flights of stairs entwine around one another just like the DNA strands of our chromosomes. Many visitors enjoy going up using the two different flights, never meeting but saying hello to one another through the numerous openings of the central newel post. On the second floor don’t forget to look up and admire the extraordinary barrel-vault coffered ceilings. There, hundreds of salamanders and crowned carved “F” letters appear in alternating patterns. You will also notice many knots made in the shape of “8” numbers carved next to the big “F” letters. 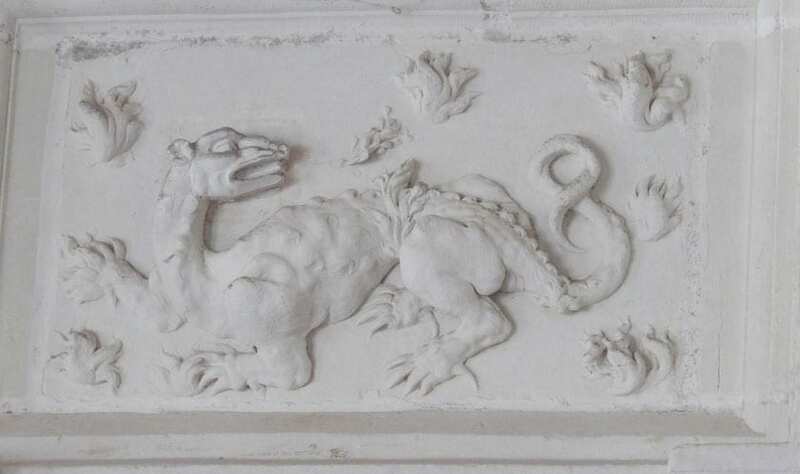 Salamanders and “8” were François’ lucky charms and can be seen on these ceilings as well as on the outer walls of the castle. If you look carefully at the ceiling of the oratory, you will maybe spot a special salamander whose tail has also been carved into the shape of an “8” number. It is the only one in Chambord, but if you go to Fontainebleau you will notice that all of its numerous salamanders have this unusual “8” shaped tail. Another unsolved mystery! If you like riddles you may also look for a few “F” letters that have been carved inverted, reminding us of Leonardo’s special writing in which every single letter was inverted. Will you be patient and perceptive enough to find them? The double-helix staircase will finally take you to the terraces that go all around the second floor. The view over the French gardens and the surrounding park and forest is splendid. You will also get a closer look to the countless chimneys, turrets, dormer windows and capitals. Here too François has left another coded message for his visitors. On top of three different turrets you will see big wrought iron “F”, “C” and “R” letters looking like weather vanes. The most probable assumption is that letter “C” is for Chambord, “F” is for Fontainebleau and “R” is for Reims. Those same three places I told you about at the beginning of this article. Could there be another explanation? 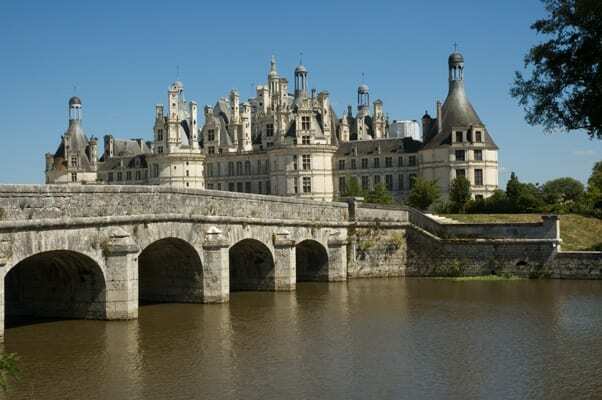 Looking for a vey special place to stay at to visit Chambord and the Loire Valley? Why not choose the Chateau d’Artigny, a castle also born in the imagination of another exceptional man, also called François, François Coty. This self-made man made a fortune in the perfume industry and as a press baron in the beginning of the 20th century. The first Chateau d’Artigny was built during the Hundred Years War on top of a high cliff overlooking the River Indre and vast forests. 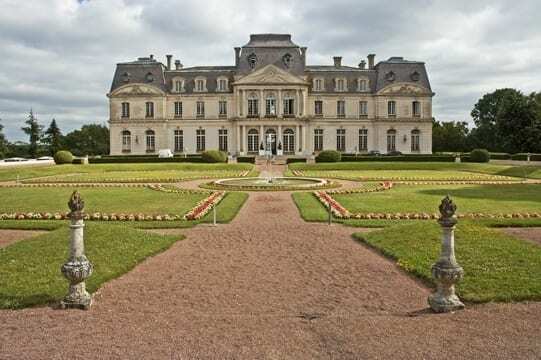 François Coty fell in love with the site and bought the estate although he didn’t like the old medieval castle. He destroyed it to rebuild his own castle according to his extravagant tastes. 150 people were hired to build an 18th century style castle sumptuously furnished and decorated where the international jet set of the 20’s and 30’s was invited to great parties. The new castle had its own power station, air conditioning system, tailor and shoe workshops, hairdressing salon, a cold room for his wife’s fur coats and a walk-in wardrobe with 78 cupboards! Forty servants took care of the 1,300 hectares estate including an orchid greenhouse, several farms, three mills, a hunting house, a presbytery and a school, while several bodyguards were on duty 24/7… Nothing was too expensive or luxurious to fulfil his thirst of grandeur. François Coty died in 1934 and the Chateau d’Artigny was neglected for many years before being turned into a luxury hotel in the 1960. 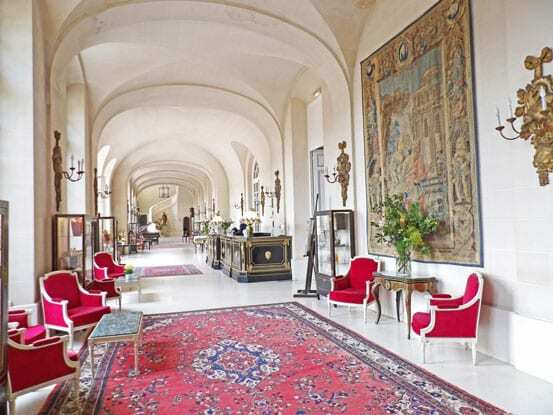 Carefully maintained and regularly restored the castle has kept all its glamour and style. 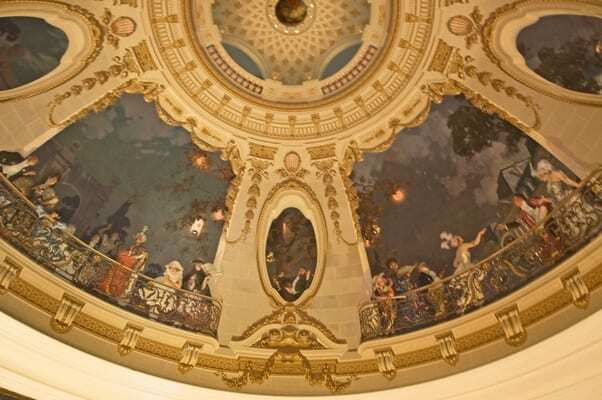 Things have little changed since François Coty’s time and you will enjoy the same elegant lobby and its impressive staircase, the same former library that is now a cosy bar and the same amazing rotunda which high dome was painted in 1924 to depict one of the joyful parties that took place here. Each of the 56 rooms and suites has its own style with period furniture and modern amenities, and offers beautiful views over the Indre River Valley or the French gardens. 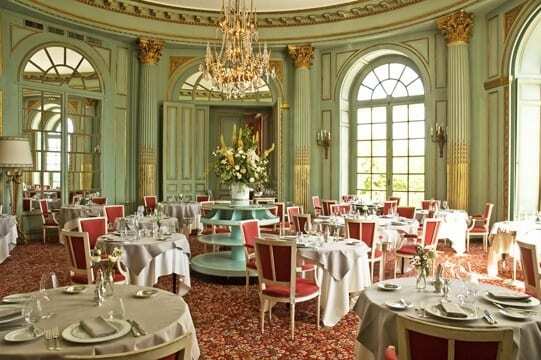 The dining room has also kept its 18th century style with marble floors, precious panelling and high French windows that give access to the outside terrace that overlooks the river and vast forests. 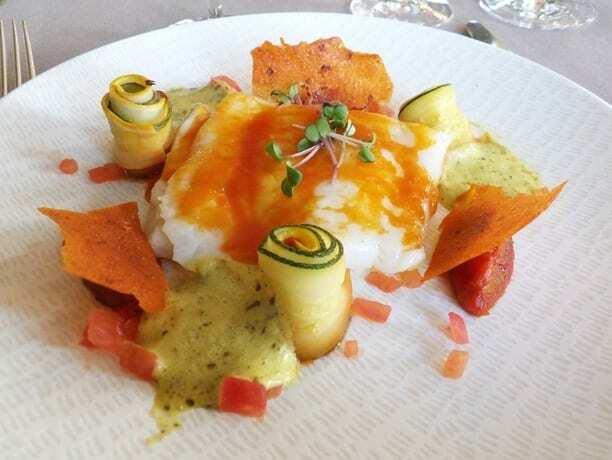 The chef, Hervé Guttin, proposes a gastronomic yet affordable cuisine. Why not taste his “Cucumber and coconut milk gazpacho with prawns and lemon”, his “Veal carpaccio with lemon and ginger mayonnaise with fresh broad beans and peas” and end with a large “pistachio and strawberry macaroon with macadamia nut and strawberry sorbet”… Of course everything is homemade using mainly fresh local produce. The wine menu is impressive and the head sommelier, Antoine Lefort, will help you make your choice or propose his own choice of food and wine pairings with a different glass of wine matching each dish of your menu. The Chateau d’Artigny also proposes Sunday brunches once each month, musical evenings twice each month with early drinks and a late dinner. The chef also organizes cuisine sessions during which he reveals his own recipes and special tricks. 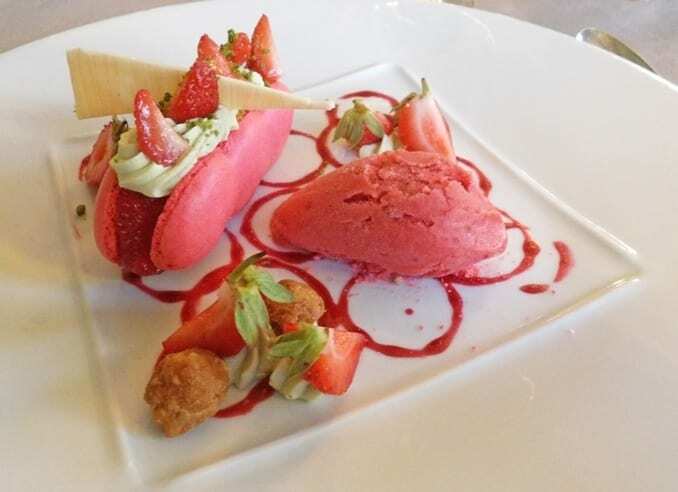 Not to forget that the Chateau d’Artigny is in the heart of the Loire Valley wine area and proposes special courses to help you discover the wide variety of local wines.